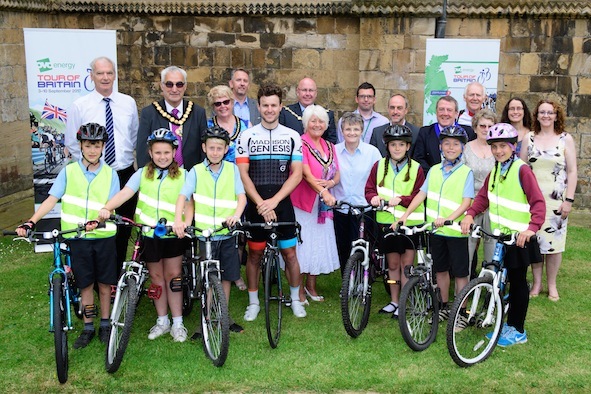 Preparations to receive the Tour of Britain cycling race on Wednesday 6th September are now well underway, following the launch of Stage 4 at Southwell Minster on the 20th June. As we begin the run up to the race itself, there are many ways you can be involved locally and help promote this section of the Stage. Why not decorate the front of your home with bunting, paint a bike in yellow perhaps or choose a team to support and come out on Wednesday 6th September to cheer the riders on! As well as being able to stand along the route, the Town Council have identified some cheer points along the way, where spectators can gather and watch the race go past. The first of those will be at the corner of Allenby Road, Westgate and Westhorpe as the cyclists negotiate the bend! The second suggestion is outside the Saracen's Head Hotel and the Minster. The third will be on the Burgage, where the cyclists will be seen turning from Newark Road into Station Road. There will be rolling road closures from 30 to 40 minutes around the expected time of between 11.30am and midday but we would respectfully request that residents who park along the route, kindly park elsewhere that morning. This is to afford some protection for the cyclists in the peloton to negotiate our narrower streets! It should be quite spectacular to see the peloton navigating their way through! For further information about the wider Stage 4 route please see page ?? Bramley readers will have plenty of opportunity to see the Tour of Britain Cycle race as Stage 4 takes in many villages in our distribution area. On Wednesday 6th September, the stage starts in Mansfield at 10.45am, moving on through the grounds of Newstead Abbey, Ravenshead and Blidworth before entering the ‘Bramley Zone‘ at Farnsfield. The tour then passes through Edingley and Halam. As it leaves Southwell it heads out to Normanton, Kirklington and Bilsthorpe, then through Sherwood Forest and Clumber Park. It will then loop the north of the county through Edwinstowe, past Worksop, before turning south through Retford and Collingham and finishing in Newark. A total distance of 175km!